Once upon a time in the far off land called Scotland, there were no golf courses and no golfers. Sheep grazed on the dunes between the sea and some of the towns. Their shepherds were probably often bored. At some time, history doesn’t tell us exactly when, on the grass closely cropped by the sheep those shepherds began to play a game. So in places like St. Andrews golf began. To today its essentials remain the same. Play starts on each hole at a place now called the tee, finishes at a cup and between is mostly on short grass or fairway. With these and minimal playing equipment and some procedural rules is how any golfer can start the game – long ago and now. A present difference is that many courses have elaborate trappings such as cart paths, edged bunkers, fountains in ponds and plush club buildings. The smallest golf courses are called pitch & putt courses. These have tee shots of limited length. The greens on many are small and unimaginatively shaped. Their tees are also usually tiny and the grass quickly gets worn off them. Mats at least give a surface that is not bare dirt or muddy after rain. Never the less, because these courses are less demanding and have lower fees than regular golf courses, they can effectively serve beginning golfers and therefore continue to generate participants in golf. Fields are the easiest sites to construct and maintain golf courses on. These permit long runs by equipment in preparing for grassing, mowing and treating the grass in other needed ways. Open spaces receive maximum sunlight, are most efficient to irrigate and, if necessary, handiest to install drainage on. These are all best for growing good grass, so cost-wise the most efficient situation for a golf course. Sometime after the “shepherd stage”, greens and tees became fixed in location, specially constructed and intensively maintained. These conditions are fully expected today by golfers on all golf courses. Contrary to this view, tees and greens don’t really have to have one permanent location. 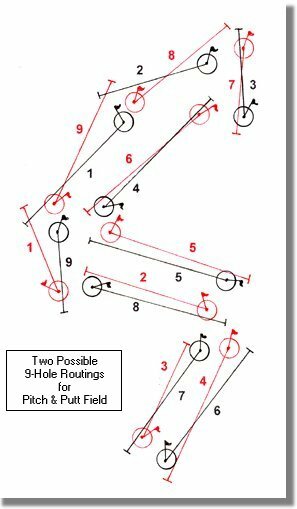 For elementary golfer-learning, holes must only have acceptable starting points, finishing areas around the cups and the grounds in between. Also important for each hole is a sufficient separation from the other holes and from any adjacent activity or facility. These requirements, however, don’t mean that each tee, fairway and green always has to be in the same place. In fact, some advantages occur when their locations can be varied and flexible. Greens are the most expensive areas of a golf course to construct. Tees are next. Fairways are far less expensive. A pitch and putt course entirely on a fairway would be a whole lot cheaper than one including the special building of greens and tees. As mentioned, fairways are most economical in a field. If a site is not originally open or partially open then some clearing, perhaps more earth movement and additional preparations will be demanded to make the entire site as a fairway. Once the grass matures as if the entire site were to be a fairway, the surface of smaller areas could be more intensely prepared and maintained. Those areas would serve initially and for a while as rather simple greens and tees. Each should be nearly level or at least have gentle slopes. These would be selected based on their current surface condition, not on their underground construction. But hey remember, we are talking about tees and greens for pitch and putt courses that beginners and relatively unskilled golfer will play. Those players couldn’t handle fast putting greens, anyway. Portions of the field not in use as tees and greens would already be like fairways and would be the fairways of the holes. Not only must the areas for the tees and greens always be carefully selected for their surface condition, the resulting route of each hole is also critical. The line of play for each hole must be sufficiently separated from every other hole and far enough from what else might adjoin them. This is for safety from errant golf balls and for a reasonable separation of the players on each hole. Due to the shortness of pitch & putt holes, that separation will require much less total space than for the holes on a regular course. The accompanying diagram shows in black one possible routing for nine holes and in red a possible later routing. As seen, the holes of these two routings would go in almost opposite directions. The players would only have to be informed where each hole is at the time of their play. Could these courses be called pitch & putt fields? When an area being used as a tee becomes worn or full of divots, another suitable area of “fairway” could be prepared to become a tee for a while. The same could be done for the greens, if and when those become worn, damaged for any reason or the grass becomes unsuitable. As long as the routing of the holes is satisfactory and the surfaces suitable, areas in any desirable locations of the site or field could simply be prepared and used as greens or tees. No one, beginner or experienced golfer, should think that a pitch & putt field is going to be like a regular golf course or even a commonly seen pitch and putt course. Its purpose is to be a small, inexpensive and comfortable place for beginners to start learning and understanding what golf is about. If its players are “turned on” by what they experience and want to “stay with golf”, after they’d gained some playing competence they could move on to conventional big golf courses. Besides pitch and putt fields will be way ahead of where the shepherds started. Definitely no sheep will be baaing on beginners’ backswings.